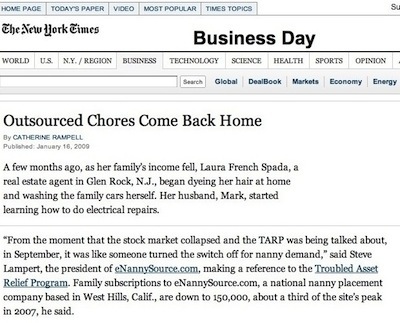 Over the years eNannySource.com has been referred to, interviewed, and written about in several major newspapers. While many of our competitors may say the same thing, we think it’s important that you know we are actively sought after as leaders in the nanny placement industry. We decided to put together a few examples from The Wall Street Journal,The New York Times, and The Miami Herald. 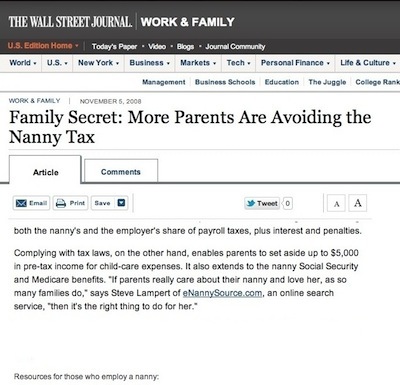 The New York Times was writing an article on outsourcing jobs making their way back to the U.S. and one which they brought up was related to the demand for nannies which had declined. 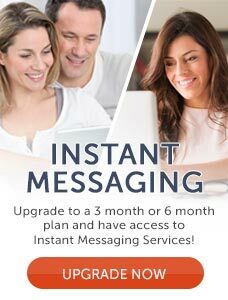 They came to eNannySource.com to get some concrete examples which we were happy to provide and to report that we have since seen huge increases to U.S. demand. 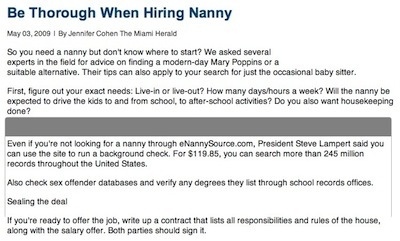 We were approached by Jennifer Cohen of The Miami Herald related to the need to be thorough when a family is hiring a nanny. We helped her get a better understanding of the complexities and costs associated with doing a thorough nanny background check. We continue to be approached by reporters from leading news sites and newspapers and we are always happy to speak with them and help them with facts and/or opinions for their stories. Any press inquiries can be directed to info@enannysource.com.